William Taylor, 29, a third generation Washington, D.C. resident stands out for a number of reasons. For one, he is an African American man who taught math at an elementary school for many years. Taylor excelled in the role, so much so that he now coaches his fellow math teachers at Aiton Elementary School, which is located in a high-poverty Washington neighborhood. He has also been profiled in the national news—specifically in The Atlantic—where it was noted that, in a typical school year, 60 percent of Taylor’s students start their first day in his class doing math below grade level, but by the end of the year, 90 percent of his students are performing above grade level. For his exemplary work Taylor earned $131,000 in 2013—another factor that makes him stand out as a public school teacher. In 2013, after seven straight years of extraordinary performance reviews Taylor received a base salary of $96,000, a $25,000 bonus for being a highly effective teacher in a high-poverty school, and a $10,000 award for outstanding teaching and dedication to his work. With the money he’s saved since he started teaching, Taylor recently bought a house in Washington, a city that annually ranks as one of the most-expensive cities in America. He also purchased his dream car: a black Chevrolet Camaro. Taylor’s financial success was made possible by the District of Columbia Public Schools’, or DCPS, revamped teacher compensation system known as IMPACTplus. Introduced in 2009, IMPACTplus redesigned the step-and-lane pay scale—which rewarded teachers solely for years of experience and degree attainment—to include measures of performance and school leadership. Before the implementation of IMPACTplus, Taylor earned $42,000 a year as a teacher and gave serious consideration to changing to a more lucrative profession. Through IMPACTplus, teachers like Taylor who earn highly effective ratings on IMPACT—the DCPS teacher evaluation system that evaluates teacher performance through multiple measures, including student performance and observation of practice—receive substantial raises to their base salaries in addition to annual bonuses. Early data from DCPS show this strategy of financially rewarding high-performing teachers more may be starting to pay dividends. A recent study found that DCPS has retained 92 percent of its highly effective teachers and 86 percent of its effective teachers between the 2010 and 2012 school years. By contrast, only 59 percent of the district’s minimally effective teachers are still in DCPS during the same time period. In addition, another recent report found that while compensation was one of the top three reasons cited by high-performing teachers for leaving the classroom in other districts, in DCPS, high-performing teachers who left the district ranked compensation at the bottom of the list—20th out of 20 reasons—for ceasing to teach. Furthermore, over the last several years, the number of DCPS applicants for teaching positions rose by 45 percent. “We have effectively eliminated compensation as a reason our top teachers leave—and we’re increasingly seeing great teachers coming to DCPS because they want to teach in a district where they can be paid what they deserve,” said Scott Thompson, DCPS’s deputy chief of human capital for teacher effectiveness. DCPS is not the only district that has overhauled its compensation system with the aim of paying effective educators substantially more than they earned in years prior, yet it is still an unusual practice. In nearly 90 percent of districts across the nation, teachers are not recognized for their effectiveness through increased compensation. This report reveals the key policy decisions undertaken by 10 districts that have made it possible to revamp their compensation systems and, at the same time, both keep their systems solvent and achieve district goals. While the specific goals of each district vary, all 10 districts used compensation to attract, retain, and leverage high-performing teachers. The 10 districts presented in this report have been among the first in the nation to redesign their teacher compensation systems. These so-called first-mover districts include: Baltimore City, Maryland; Denver, Colorado; Douglas County, Colorado; Harrison School District 2, Colorado; Hillsborough County, Florida; Lawrence, Massachusetts; New Haven, Connecticut; Pittsburgh, Pennsylvania; Putnam County, Tennessee; and Washington, D.C. First-mover districts vary in location, size, governance structure, and student academic performance, proving that diverse districts throughout the country can find ways to reform teacher compensation systems regardless of context. Teacher effectiveness: The measure from teacher evaluation systems used instead of—or in addition to—years of experience and advanced degree attainment. Speed of salary growth: The number of years it takes for teachers to reach the highest salary level in a school district. 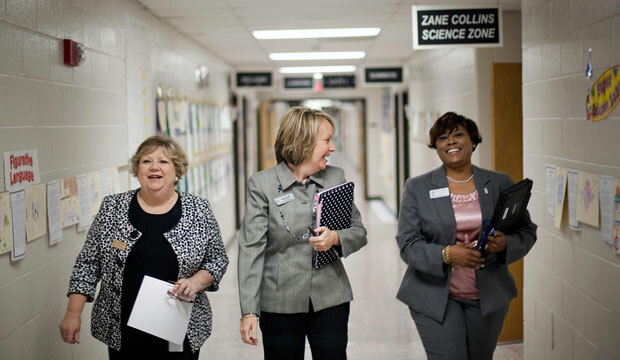 Career pathway opportunities: The avenues available to teachers to earn additional compensation by taking on increased roles and responsibility within their school buildings and/or districts. Incentives for hard-to-staff schools and positions: The additional compensation given to teachers for teaching hard-to-staff subjects and/or teaching in a high-needs school. Bonuses, rewards, and recognition: The one-time bonuses, rewards and/or recognition offered to individual teachers, groups of teachers, or school-wide for student-achievement gains. Opt-in timeframe: The amount of time teachers are given to enter the new teacher compensation system. 1. Differentiate compensation based on roles and responsibilities. Implementing differentiated career pathways gives districts the opportunity to increase pay for effective, expert teachers who take on both additional or different roles and responsibility. When designing differentiated compensation structures, districts should provide rewards that are commensurate with job responsibility. 2. Set starting salaries to meet market demand. When setting starting salaries, districts need to be aware of their competition from neighboring districts. Districts should set starting salaries that are substantial enough to attract high-potential teachers, but not so high that they compromise the district’s ability to appropriately reward and retain experienced teachers who prove themselves effective. 3. Align teacher compensation redesign with fair and proven teacher evaluation systems. Teacher compensation systems should be aligned with fair and proven teacher evaluation systems that include multiple measures and reliably distinguish among levels of teacher effectiveness. Districts should refine their teacher evaluation systems until teachers and principals have confidence in these new systems before tying them to compensation. 4. Shift pay away from years of experience and advance degree attainment. Districts should consider moving away from primarily rewarding additional educational attainment and years of experience and toward salary raises based substantially on effectiveness, roles, and responsibilities. 5. Use compensation incentives to attract highly effective teachers to hard-to-staff schools, districts, and subjects. Districts should use compensation to attract highly effective teachers to hard-to-staff schools and positions. The number of teachers needed to fill the positions in each school will differ based on context. 6. Emphasize extra pay for effectiveness and career pathways instead of small bonuses. Districts should prioritize increases in base salaries based upon a teacher’s effectiveness or for taking on increased or different roles and responsibilities. Increases in base salaries signal to teachers that the district values them and encourages them to think differently about their long-term career trajectory. 7. Accelerate the timeline to earning the maximum salary where possible. To expand the effect of redesigned compensation systems, districts should minimize the number of years it takes to reach the maximum teacher salary. However, because this policy change may affect many early career teachers, districts should set a high bar for the rigorous differentiation of teachers in order for the redesigned system to remain financially sustainable. 8. Allow teachers to opt-in to new compensation systems within a set timeframe. If the new compensation system reduces the pay of some teachers, districts should allow current teachers to opt-in to the redesigned compensation systems rather than forcing all teachers to switch to a the new system. This opt-in option should be limited to a set period of time following the transition to a new compensation system in order to make the fiscal effect more predictable and sustainable. The purpose of teacher compensation reform is to improve school districts’ ability to attract, retain, and leverage a high-performing teaching force that aligns with a district’s student-performance objectives and overall priorities. Ideally, districts will be able to adjust current budgets in order to achieve this goal. The resulting compensation system should be one where the majority of teachers are earning equal or higher salaries than they were prior to the reform. Karen Hawley Miles is the founder and executive director of Education Resource Strategies Inc., or ERS. Kaitlin Pennington is a Policy Analyst on the Education Policy team at American Progress. David Bloom is a principal associate at ERS.